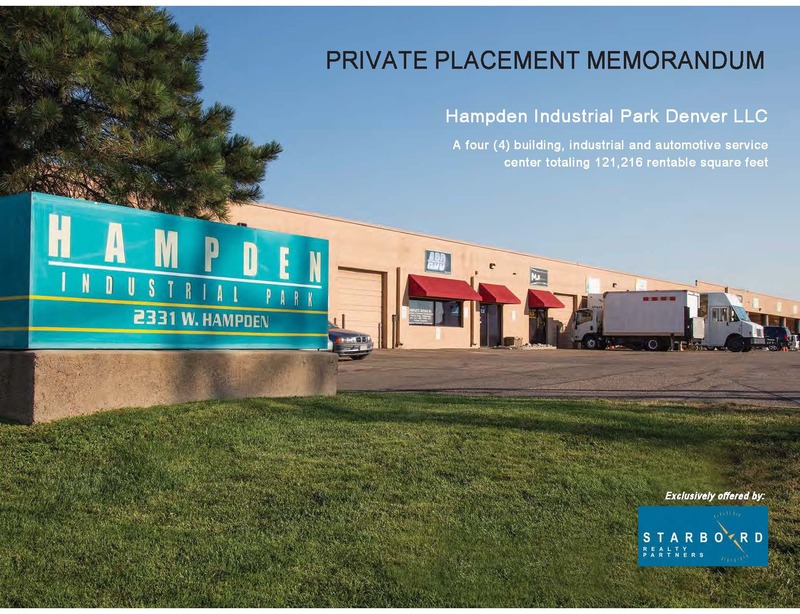 Starboard Realty Partners is pleased to present the opportunity to invest in our acquisition of the Hampden Industrial Park a four (4) building, multi-tenant, low-finish industrial business park totaling 121,612 rentable square feet situated on one (1) parcel totaling approximately 8.4 acres. The property is ideal for small industrial/service center and automotive users and located in the well-established South Central Denver submarket. Improvements include 11′ to 13′ warehouse clear heights for the grade level served buildings, abundant parking at a ratio exceeding 3.6 stalls per 1,000 rentable SF, a secured fenced yard for select users utilizing a disproportionate share of parking, common-area painting booth and car wash, and an air compressor system with redundant backup that services tenants in all buildings. The latter three amenities are not available in any directly competing parks. The project was constructed in phases, with Building A constructed in 1971/72 and Buildings B, C and D later developed in 1986. Most of the units feature nominal offices and thus landlord-provided HVAC is limited to approximately 9 (of a total of 83) units. We have set aside reserves for the installation of a 10-year elastomeric coating to the existing metal roofs, together with aesthetic upgrades to the property, including exterior painting, upgrades to monument and billboard signage, landscaping upgrades and parking lot repairs and slurry. We are purchasing Hampden Industrial Park at 100% occupancy with in-place rents ranging from 15% to 30% below current market levels (depending on the unit) as the existing ownership (local owner with extremely low basis) has been focused on preserving occupancy and not pushing rents. Current rents at the project (ranging from $11.00 – $13.50 gross) are in line with asking rates at competing parks, but for units at least twice as large in size. Tenants, specifically providing automotive services, do not have options when seeking to lease less than 2,000 square feet. Moreover, many of the competing parks cannot offer space leased for automotive related uses. Following completion of our budgeted improvement plan, the property is poised to benefit from a more aggressive marketing and property management campaign to push rents and increase income. Leasing of the property was conducted by an on-site property manager with little knowledge on the market, minimal leasing experience and a reluctance to push rents due to personal relations with the tenants. Moreover, increasing rents to market levels should be expedient as all tenants, excluding one, have leases that either expire in less than 12 months or are leased on a month-to-month basis. Profit potential will be realized through minor capital improvements, lowering expenses and removing of duplicative services (e.g. salary to onsite manager and property management fee), converting existing leases from gross to triple net (NNN) structure (to prevent loss of revenue growth following property tax reassessment) and increasing current rents to market. Additional profits can be realized by increasing the rentable area of a handful units to include covered loading areas (permitted by BOMA and longstanding industry standard) and by converting select units to “automotive man caves” that we can lease at significant rental premiums after a minimal investment improving the unit.